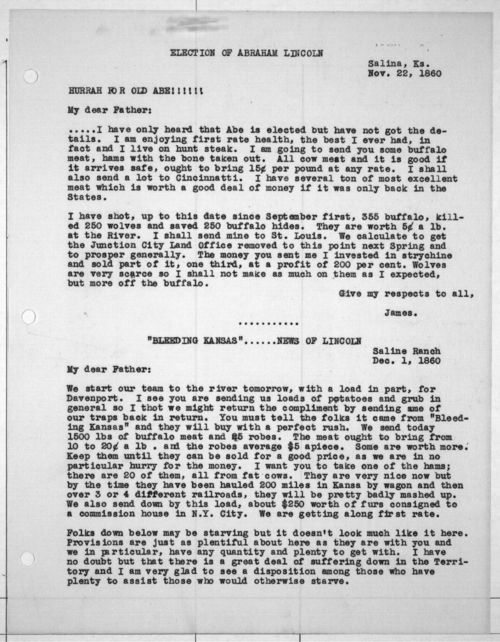 James Mead writes from Salina, Kansas Territory to his father who lived in Davenport, Iowa. Apparently, Mead has heard news of Lincoln's election, but he does not know any specifics. The main focus of the letter is Mead's experiences buffalo hunting--he intends to send his father some of the meat. Between September 1 and the date of this letter (November 22, 1860), he had shot 355 buffalo and killed 250 wolves. He has saved 250 buffalo hides and plans to sell them in St. Louis, Missouri. Also contained on this sheet is the first page of a letter dated December 1, 1860. This second letter is item 90626. These typed copies of the James R. Mead's letters were donated to the Kansas State Historical Society by Mr. Mead's family in 1940 when the originals were still owned by the family. The originals are now held by Wichita State University.